This applet shows the motion of a "planet" around a "sun." The size of the orbit is controlled by the slider "a" and the eccentricity (or stretched-out-ness) of the orbit is the slider "ecc". You can move the graphic within the window by clicking in the dark region and dragging the graphics as needed to get a good image. There are two vectors available, one showing the force of gravity, directed toward the sun, and another showing the planet's velocity, which is always tangent to the orbit. Both of these vary in length during the orbit (if the eccentricity isn't zero); the gravitational force varies as the inverse square of the distance between the planet and the sun, while the velocity varies according to a rule that is also based on this same distance (the exact rule is derived from the "vis-viva" energy relation). The lengths of these vectors are controlled by the "Fscale" and "VVscale" sliders (Force and Velocity Vector, respectively). Adjust these as needed to get a good picture. Note that the vectors can be turned off by setting both sliders to zero. For higher eccentricities, these vectors will vary dramatically during the orbit; their lengths have no numerical significance, but their variation during the orbit is worth watching. The planet's motion is calculated using a numerical solution for Kepler's Equation. 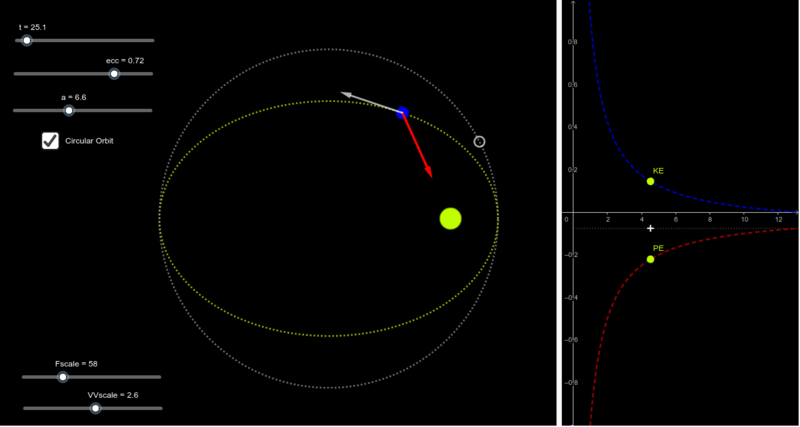 An option is available via the checkbox to show a uniform motion around a circular orbit which has the same period (time to go once around) as the planet. Note how the planet speeds up and slows down, according to Kepler's Equation, while the uniform, constant-speed motion will lead or lag the planet, but always catch up right at the end of the orbit (it also catches up at the halfway point). The secondary screen, at right, shows the energy on an arbitrary vertical scale, vs. the radial distance between the sun and planet. Both the kinetic and potential energies are shown, and the "+" symbol shows their sum. Observe how this sum is constant across the orbital motion, and is negative, indicating a bound orbit. Set up the "a" and "ecc" and vector-length sliders as needed; it's best to do this with the time slider at zero, then press the right-arrow key once (this moves the planets a bit away from zero). When you're ready to run it, click on the time slider and then press the space bar. You can turn the circular orbit on/off, or change the vector lengths, while the planet is moving. The orbital period is set up to change with the "a" parameter (essentially, the size of the orbit), according to Kepler's Third Law. The time base is scaled so that a value for "a" of 7, which produces a good size for the graphics, corresponds to a period of 365 "days." You can see that, as "a" varies, the time slider reading just as the planet finishes one trip around the orbit will change. Smaller time values if "a" is less than 7, larger otherwise. (To see this, with the motion stopped, set the time slider to its max after changing "a".) Note that a "slo-mo" motion is available if you click on the time slider and then use the arrow keys (Control-arrow is a bit faster). This is useful to watch the circular "planet" catch up with the Kepler one; with the regular motion this happens very fast.